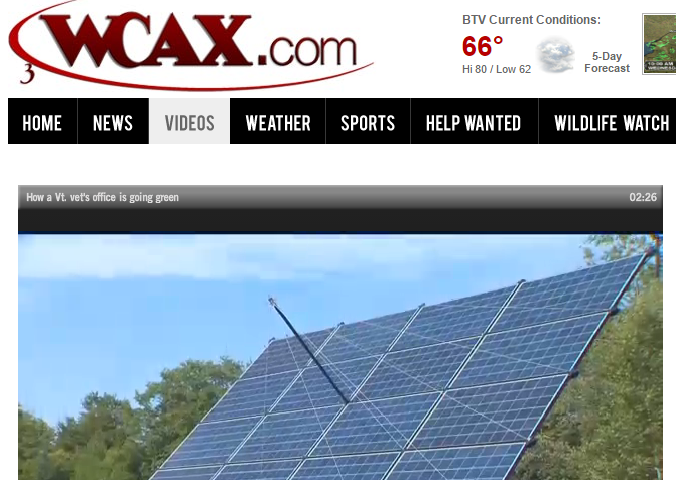 WCAX TV-3 in Burlington, Vermont has profiled a recent Solaflect PV Tracker installation at East Haven Veterinary Services. Dr. Sally Schleuter explains that going solar was the logical and responsible choice, especially since the clinic is part of the Vermont Business Environmental Partnership. You can watch the profile below or visit WCAX’s news page. All of us at Solaflect thank Dr. Schleuter for leading the way with solar in vermont.